Cinnamon Girl - There Are Inkspots On My Page! You can read this review, and others, on my blog. This might just be the best book I've read this year. It is fun, it is quirky, and it captures all of the thoughts and feelings of leaving school/changing life stages perfectly. All while the world is ending. Set in a quiet little country town in Australia, everything is turned on its ear when a youtube video predicting that Eden Valley is where the world is going to end, goes viral. While trying to manage all the people that turn up to celebrate the end of the world, Alba is also trying to come to terms with school finishing, her friends making plans to move away, and trying to decide what to do with the rest of her life. While this is obviously referring to leaving high school, the same thoughts and uncertainty applies to any major life change, making the whole book relatable no matter where you're at. I absolutely loved Alba, it was so easy to identify with her thoughts and feelings. She's fun and sassy and has no problems saying what's on her mind - for the most part. It was really refreshing to come across a female character with confidence, and such a matter-of-fact attitude about herself. I liked that her insecurities weren't about her appearance, but her skills or losing touch with her friends. There really needs to be more characters like this out there. 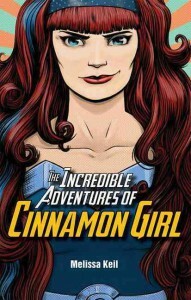 I also loved how her comic character - Cinnamon Girl - reflected her inner turmoil as she works through everything going on. The rest of the cast are also brilliant, and it's fun getting to know them as the story progresses. The only character I never quite warmed to was Dan - and I really don't think I'm supposed to. The romance element was introduced and portrayed incredibly well - it's not a standard soppy love triangle, it's funny and real and a delight to watch develop. I cannot recommend this book enough, regardless of where you're at on your own journey. There is something for everyone, and it's just such a fantastic book.